The Hakalau Plantation and what we call the Hakalau Kuleana, the land between Kolekole and the Mile 20 marker in Ninole, was a bustling place. Here's a brief look at some of the hangouts. Contact us to share your memories about your favorite places. 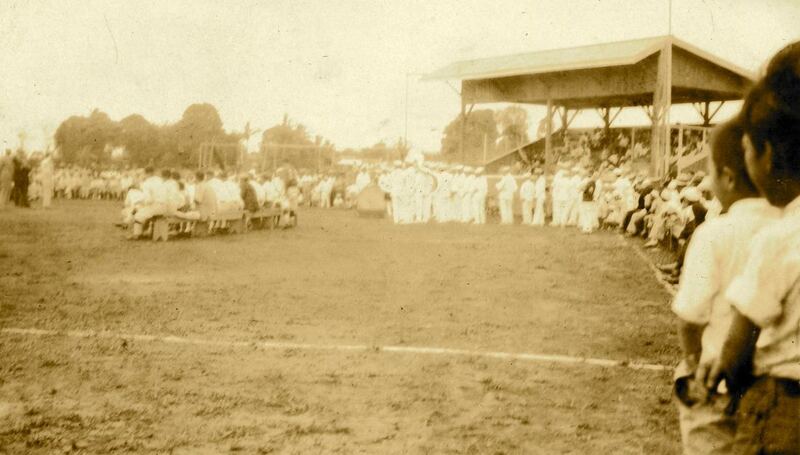 Photo of the dedication of the Hakalau Veteran's Park in 1930 from the Waich Ouye Collection, courtesy of the Ouye family. 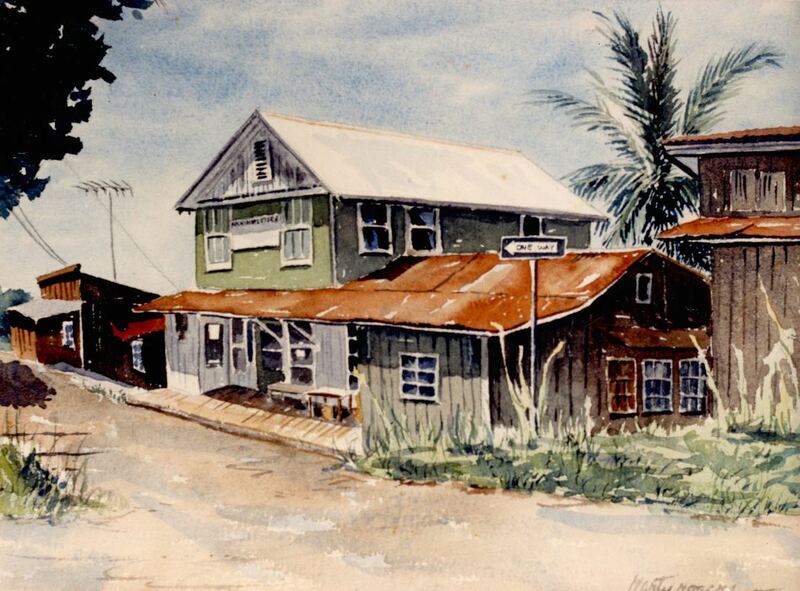 Nishiyama Garage on the Old Wailea Road (see map below) circa 1942 or 1943. Standing on the left bus is Kazumi Hamada, about 14 years old. Next to him is Susumu "Dango" Kimura. On the far right are Shigeo ("Ribs") Nishiyama, about 26 years old, with his two children, Dennis and Roy. 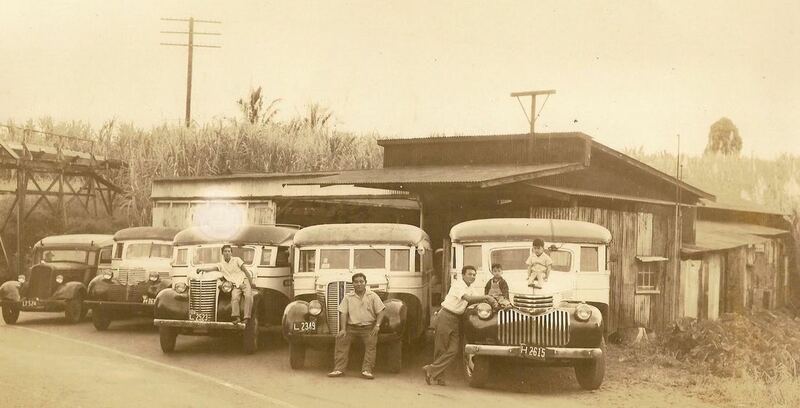 Shigeo's father, Gosaku Nishiyama, built the vehicle at far left from a 1933 Dodge truck, creating a 20 passenger bus. The building is the 2nd Nishiyama Garage -- the first burnt down in 1939, and four busses were lost. Plantation camp map from 1947. Note residences in vicinity of Nishiyama Garage: Kishimori, Nishiyama, Kimura, Hamada. All part of the story. My uncle "Ribs" & cousins Dennis next to him & Roy. Both uncle Ribs & Roy are gone now. And "Dango" we called him big "Dango" and his younger brother was small "Dango". The handsome guy sitting on the middle bus you may guess is me. Don't remember when this photo was taken but seems like I was 13--14 years old at that time so could have been 1942-43? long time ago. Big "Dango" was one of the bus drivers that transported people from Hakalau to Hilo & back. Of course it included people from Hakalau, Wailea, Chin Chuck, Stable Camp, Kamae Mauka & Kamae Camp. About that time Uncle "Ribs" started a trucking business hauling & distributing store supplies that retail stores like Yamamoto Store & Fujii Bakery Store in Wailea and retail stores in Honomu town had put in their orders with the wholesalers in Hilo. floors & wiping the seats. The toughest work was in gassing up the empty gas tank of each of the buses. There was only one gas pump which was manually operated & held only 10 gallons. Each bus would take in at least 20 gallons so you can imagine how many times I needed to fill the pump 10 gallons at a time with cranking the pump handle manually. One benefit I got from doing this work was that I self taught myself to drive since all the drivers had gone home after leaving their busses at the garage & someone had to park the bus next to the gas pump nozzle to gas up. So much of my story!!! The building was the garage for the busses to be kept while not in business and was located at the bottom of small hill entering Wailea business section & was across the home of the Kishimori family. That's my story as best I can remember. In the mid 40's WWII was intensifying and Uncle "Ribs" had expanded his trucking business with several trucks in his fleet. U.S. Marines were returning from battles in the Pacific & had built a large Marine Camp "Camp Tarawa?" in Kamuela. Coca Cola "Coke" drink was popular at that time. 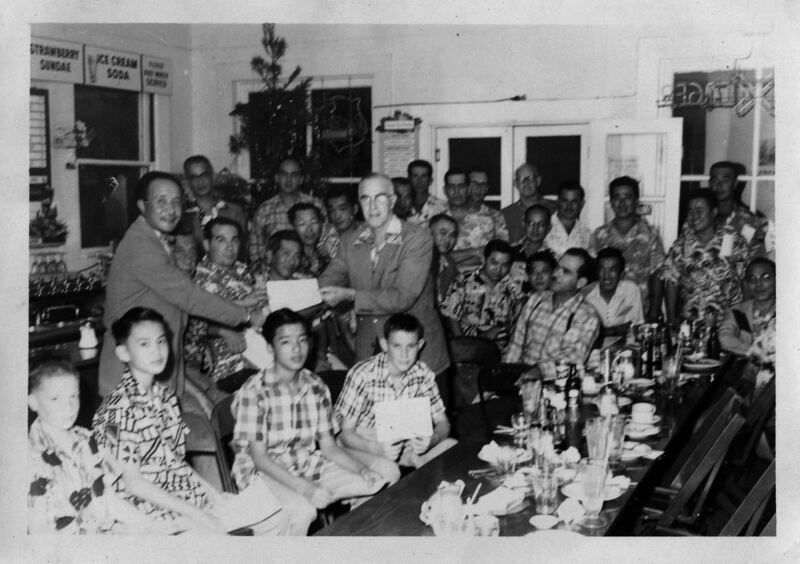 Uncle had a contract with the only Coke company in Hilo to supply the marines in Kamuela with the drinks. I now became my uncle's helper to load/unload cases of Cokes from the truck. In January 1945 I became a 16 year old teenager. The very next day of my birthday Uncle took me to Hilo Police Dept. to get my drivers' license. On several trips he would let me drive the truck and teach me. Few days later he let me have a truck to have it loaded up with Cokes for delivery to where the order was for that day. Most of my deliveries were to small retail stores that opened for business because of the large number of marines that filled the camps. By now I was one of his paid employee among 5 or 6 others, I was delivering Cokes as far out as Capt.Cook in Kona. We made deliveries to stores in Kohala too. And later we were hauling bagged sugar cane pallets to Hilo wharfs for loading onto ships waiting for bags of raw sugar cane to fill their holds. Then came the 1946 Tidal wave that hit the Islands & by then the war had ended. End of story...for now...about the Nishiyama busses. At this time of year, the Buddhists celebrate O-Bon. As I can remember we too had floating lanterns at Kolekole Park. Grandpa Ito made the boat about 3 feet long and 18 inches wide, I think. It was filled with fruits and vegetables. We took the Samura bus and rode to Kolekole. At the park we put on a lighted lantern and sailed it at the mouth of the river. After we return to the church and dance till mid-night. They had shave ice, hot dog and other food that we could purchase. The dancers were treated to rice, pickled relish and nishime (I think). This was the best part. As for the dance, we dressed in kimono in those days. Mrs. Nakano, all dress us and made the slash very tied , we could hardly breath. As I was growing up in upper camp of Hakalau. We to learn to do craft. On Saturday morning Mrs. Mamiya taught us how to do Japanese embroidery (Japanese shishu). It was a fine silk tread or weaving handbags or flower arrangement. I guess this kept me from getting into mischievous or how to be lady like. Now, I think about it the children now days does not have those experience. Note: Sholei (Shorei) Nagashi is an event to see the spirits off, similar to lantern floating. Boy Scout meetings at the Hongwanji: We learned a few things about first aid, sang songs, went camping, played different games, all walked down to the gym to march. I was the bugler and played taps at the end of every meeting... A real shout out for the scout master Mr. Morikawa. He put his heart and soul into keeping scouting going in Hakalau. I walked home to Wailea with Dennis [Nishiyama] sometimes. We talked about baseball all the way...how many home runs will Hank Aaron hit this year; that sort of thing. Andy [Silver] and I were always trying to think of things to do. Walking down to Kolekole and fishing for godi was one and rolling down the Silver's yard in the inside of a cane truck inner tube was another. Baseball at the park was something I did, but Andy had no interest in....Oh! running down thru the camp to catch the school bus on the main highway after missing it when i stopped in front of the house.